This is very peculiar given all of the other events that have occurred this week. It is very sad that these things have been happening. Hopefully people will learn towards the future.. For Boston and Texas, all prayers are in our hearts! Let's hope this was a plain & simple accident, not another malicious incident! Prayers & well wishes to the injured!! 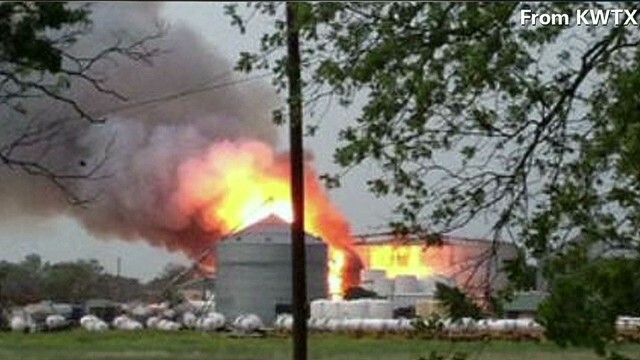 This is actually not uncommon for plants like this... my company does failure analyses on plant explosions. Usually has to do with cracks or leaks and built up pressure. Local news reporting 5 fireman and 1 police and 60 to 70 killed in explosen. I dont know if my own post posted or not but thats what i was saying, the info is 200 injured, 60-70 may be dead, there has been 2 explosions and the town may be evacuated shortly cause of the hazard. CNN needs to update their info on tv! they can go hide and rot....five firefighters just died in the line of duty. Five of my brothers. Sadly more dead and injured! When it rains it pours! mmmm...wonder if ammonnia anhydrous substance were used in boston explosion and if that area, inaddition to a fertilizer plant, also has pressure cooker supplier there also? @ s kel not to belittle your brothers but also 60~70 workers too! terrible and right in the wake of Boston. The whole situation is devestating and i cant help wondering if they are in some way related. Only because the tool running North Korea has made references to texas in some of his threats and because some ppl have said the 2 men picked up by the FBI for the boston bombing look korean.